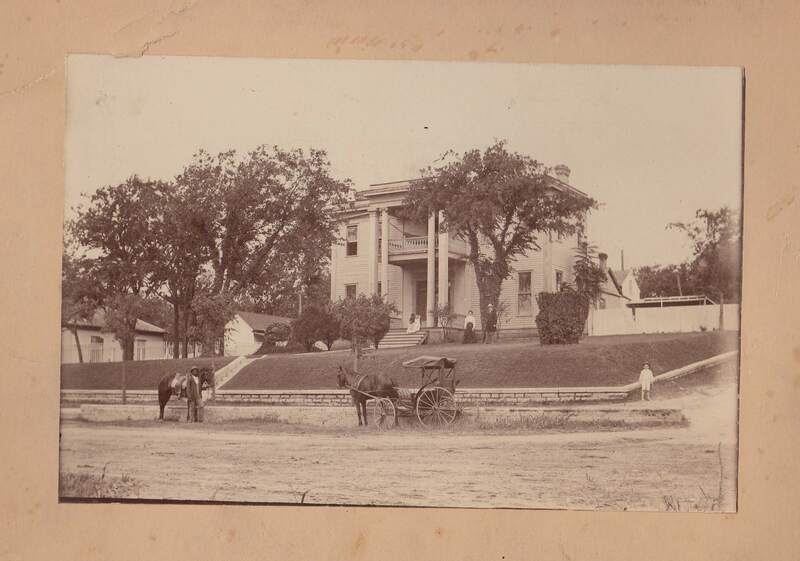 You may remember that I was a little obsessed with this house in Austin, where the Jameson family lived at the turn of the century: I knew that it wasn’t standing anymore but aside from another old photo which I’d found at the Austin History Center’s website, I couldn’t find out a thing about it. 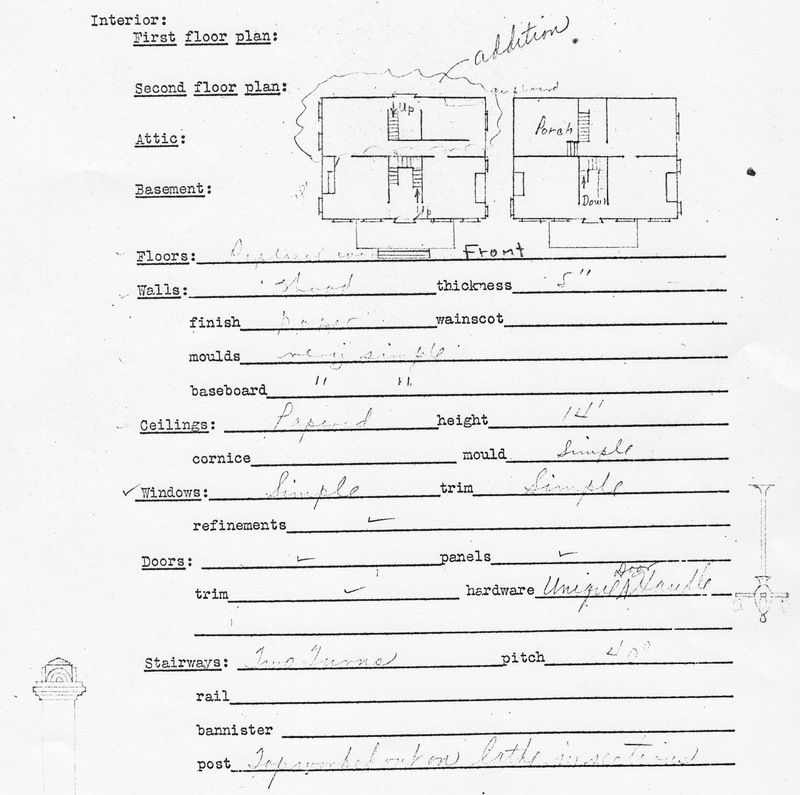 The history center has a number of historic building files and lets you search their archives by street address, but nothing came up for 1108 Colorado Street. There was a file, though, for 1104 Colorado, but the contents weren’t online. I was beginning to suspect that it was the file I was looking for, and when I finally emailed a librarian at the history center and showed him the old photo, he explained that at some point, a few years after my great-great grandparents moved out, the house had been moved down the block on logs. Not sure when the above photo was taken, or whether the house was in its original or moved location (moved, I think). The diagram below seems to indicate that the one-story wing on the back was added later. Does that mean the house originally had just two big rooms on the first floor, and two on the second? What was it like when the Jamesons lived there? 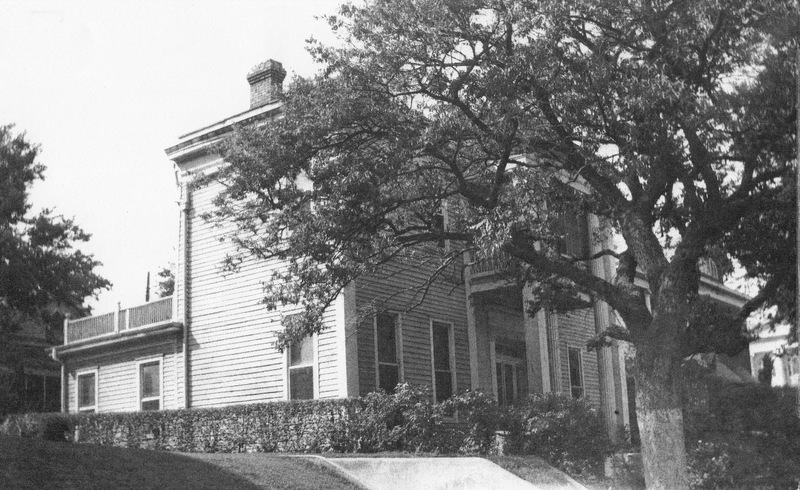 The house, built in 1852, has come to be known as the Haynie-Cook House. Dr. Samuel Garner Haynie, who had been the mayor of Austin in 1850 and 1851 (and again in ’63 and ’64), commissioned Abner Cook, a prominent Texas architect who worked on the interior of the 1852-3 state capitol and later built the Texas Governor’s Mansion, to build a residence on some land he owned across from the Capitol grounds. Prior to that, Confederate general Albert Sidney Johnston had lived on the property, in a cottage Haynie had built around 1850. It’s possible he also lived for a short time in this new house Cook was building, as Joe Lee Jameson believed, even though it was being built for Haynie. Confused? I know I am. Suffice it to say Albert Sidney Johnston had at least been around. The place cost between $7500 and $9000 to build, making it one of the most expensive houses in Austin. It turns out the Haynie family lived in the house for only a short time—if at all—before selling it to Abner Cook due to financial difficulties. So Cook moved into the house that he’d built and lived there with his family the rest of his life, with his widow remaining there until 1885. After that, the house was bought by another former Austin mayor, Leander Brown. From there the ownership records get a little murky because they refer to lots, not house addresses—all I can tell is that the place passed through the hands of a few more people, described in the historical summary as real estate banker types, who may or may not have lived there. The occupancy record, compiled from old Austin directories, doesn’t list the Jameson family at all, although it shows a window of time from 1897 to 1902 in which “Not Sansom or Nalle” lived there—Sansoms being the residents previous to 1897, and Nalle as the owner in 1903. This corresponds roughly to when the Jamesons lived there. So while my great-great-grandparents appear by name in the oldest photo of the house in the history file, they never owned the place, and for some reason their residency was never reflected in the city directory. I have a theory as to how the Jamesons wound up living there. I can’t help but wonder if the house was something of a white elephant throughout its existence, starting with the original owner who couldn’t afford the place. Certainly it was considered an important house, but by the end of the 1800s, nearly fifty years after it had been built, would it have been considered outdated, perhaps difficult to heat, an impressive but impractical showplace? 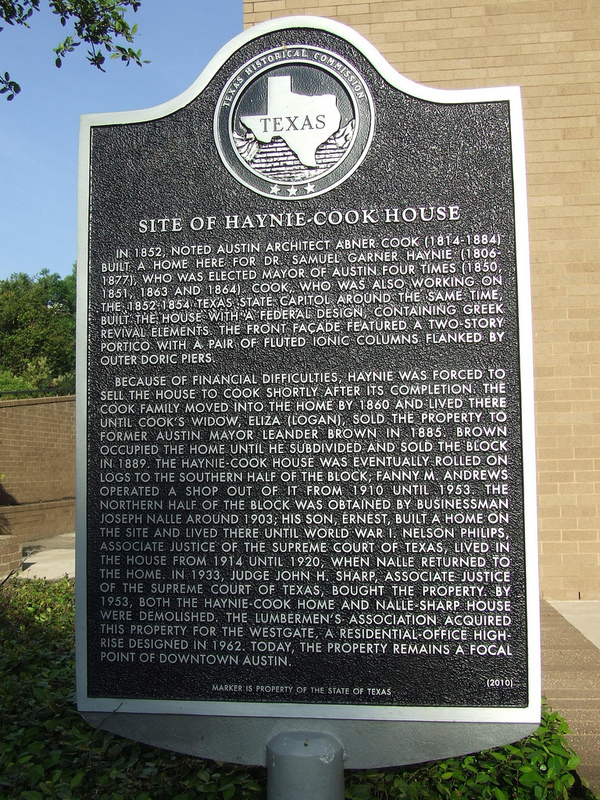 The well-to-do in Austin could build fashionable Victorians with more modern features (like kitchens and servants’ rooms, instead of outbuildings dating back to the slavery era), and the Haynie-Cook house may not have been able to serve the needs of an established wealthy family. But for the small family of a rising young bureaucrat who had been an aide in the newly elected governor’s campaign, and who had recently relocated from staff quarters in an asylum downstate, the house could have been a step up, and no doubt the location across from the Capitol building would have suited them well. 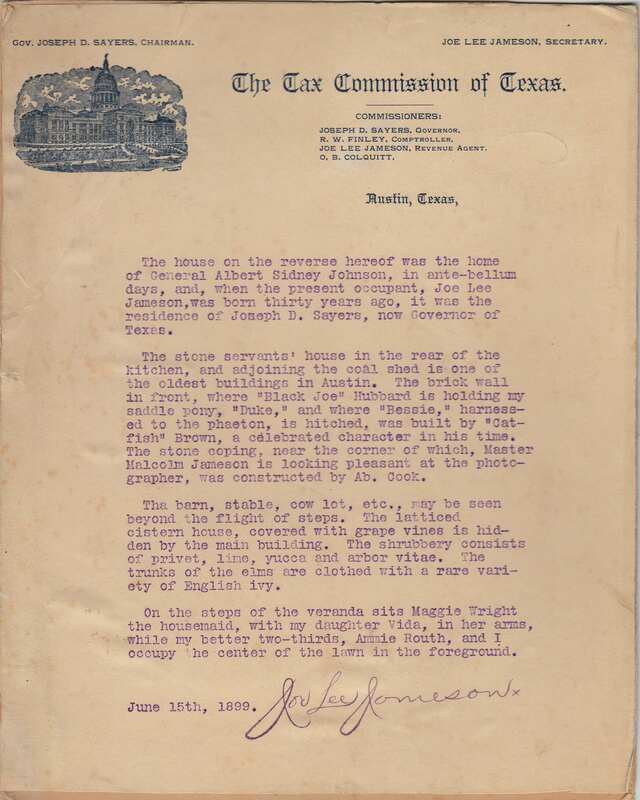 Whoever owned the house at the time would have likely had influential connections to Texas politics; giving Joe Lee Jameson and his family the opportunity to live there could have been a reward for service and loyalty to the current administration. Perhaps also the Jamesons, or whoever arranged for them to live there, were doing the owners a favor by keeping the place occupied and maintained. In the letter Joe Lee wrote about the house, he seems to be proud of the history of the place but there’s no indication that any of it belongs to him. 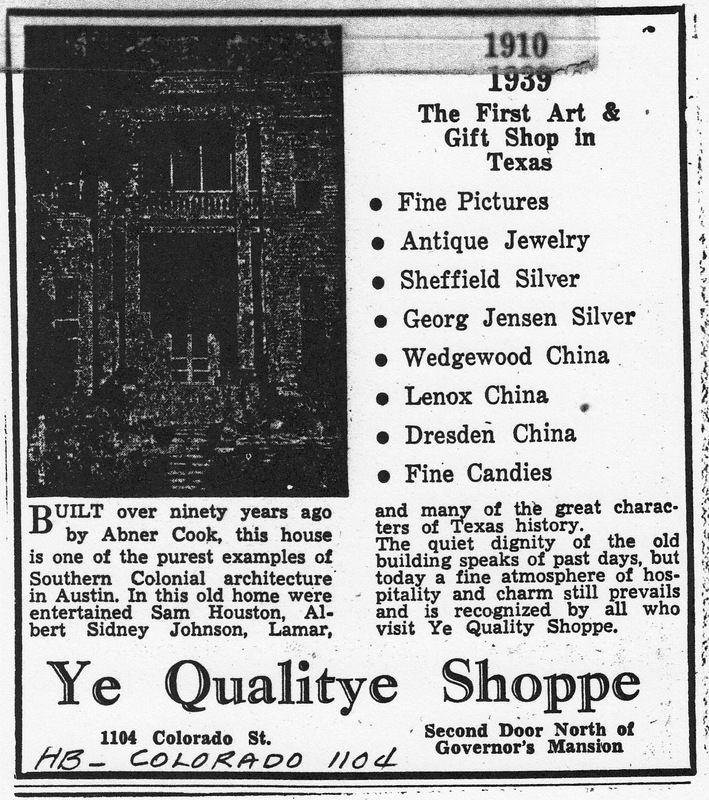 About a decade after the family vacated the house (moving to Beaumont), the house was moved down the block by a new owner, and the owner’s sister, Fanny Andrews (aka “Miss Fanny”) opened a gift store on the first floor called “Ye Qualitye Shoppe” and then eventually moved in upstairs. By this time the house had clearly seen better days. By Miss Fanny’s account, the place wasn’t in such great shape either back around 1910, after her brother had bought the house because “it was too good a house to waste” and moved it down the block to the lot he owned. “The house was terrible,” she was quoted as saying in her biography. “The colors in the house were terrible. One bedroom was red, one green, the west bathroom was red.” Miss Fanny fixed up the place and then opened the shop, which she ran for more than forty years until it closed in 1953. 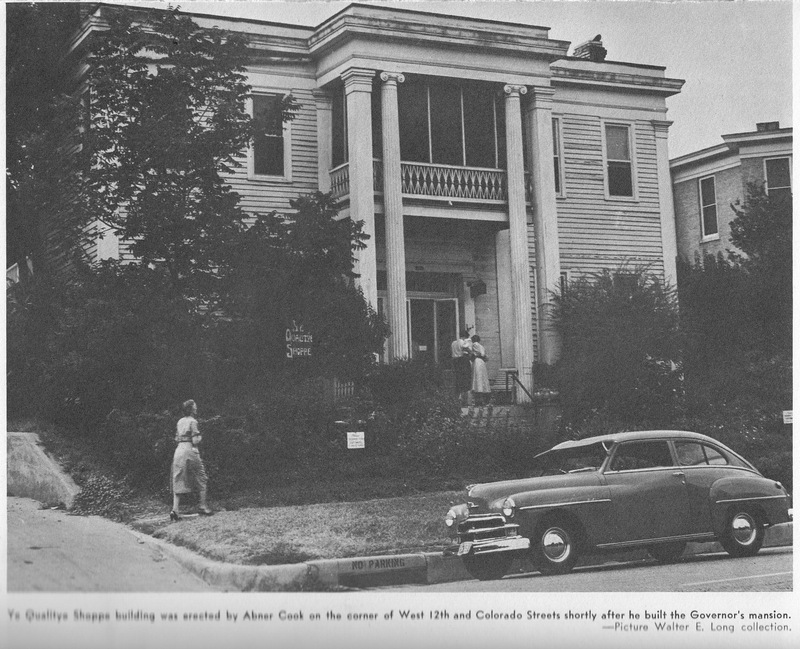 The house was demolished the same year as part of developments to the Capitol area. 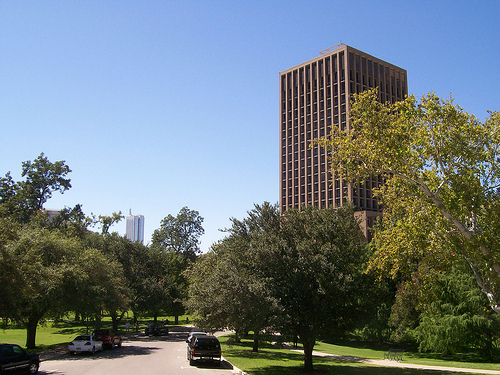 Today the Westgate Tower at 1122 Colorado, completed in 1966, stands in its place. Despite all the development, I could still see the land ridge that ran beneath the whole block. And when I turned around and looked across the street, I could see what the view must have been from the front porch of the house at the time the Jamesons lived there. 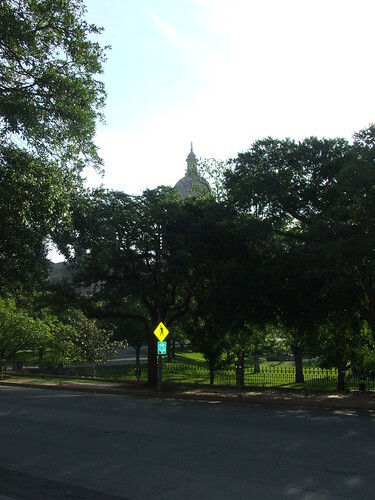 Except for the trees, it wouldn’t have been much different—the Capitol and the surrounding grounds. Some Haynie family descendants also have a copy of the photo that shows my great-great grandparents. 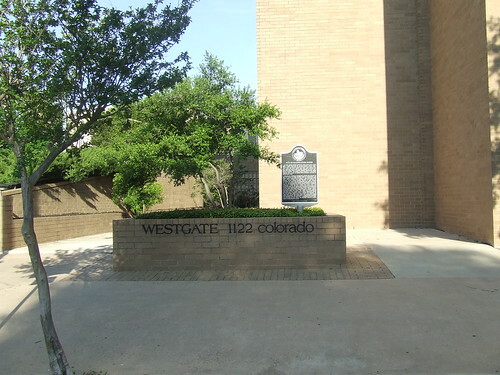 The Westgate Tower is thought to have some historical significance of its own. This has been the deepest historical research I’ve done so far on a family history topic. It started with that one photo, and I suppose that image represents an anchor for me, a point in time that makes me want to find out more about everything that led up to it and everything that came after. That photo was meant to convey that the family had arrived; I have to wonder what it—and the house—meant to them after tragedy struck there not long afterwards. It’s one of those things I guess I’ll never know.